The Royal Australian College of General Practitioners has released new guidelines for prostate cancer screening in General Practice. 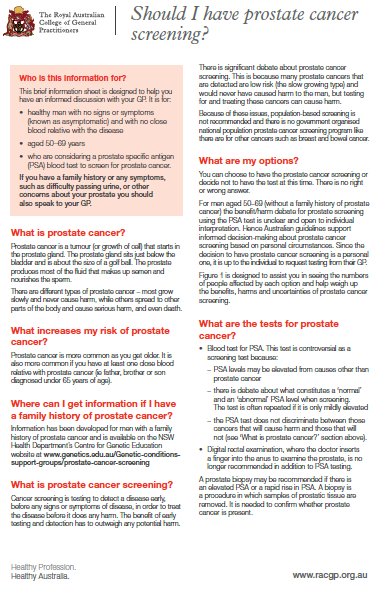 It reiterates that for men aged 50–69 without a family history of prostate cancer, the decision to have prostate cancer screening must be an informed and personal one. While the digital rectal exam (DRE) remains useful it is no longer recommended at the time of primary PSA screening in these men. While the “no DRE” recommendation is a surprise to some, Urologist and Clinical member of the Centre, Dr Peter Sutherland said the recommendation has come from the Prostate Cancer Foundation of Australia and the National Health and Medical Research Council’s review in which they did not find enough literature to support DRE in the primary care setting. He further commented that magnetic resonance imaging is increasingly playing an important role in diagnostics, and that while DRE remains an important investigation in his urological specialist area, he will see a MRI scan often before he has to consider the need for a DRE. This entry was posted in News and tagged DRE, prostate cancer, PSA, screening. Bookmark the permalink.